Tuning is the adjustment of the pitch of each note on the piano to make the entire instrument musically pleasing. Pitch means how sharp (high) or flat (low) each note should be. A single note on the piano can be one, two, or three strings sounding in unison. Tension on a string is increased to raise its pitch, and decreased to lower its pitch. 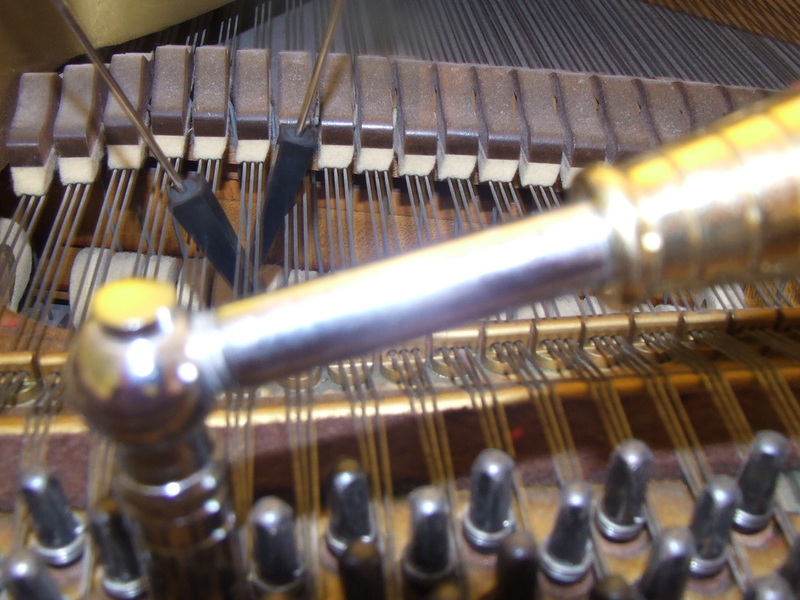 Tension is adjusted by making slight movements to the piano's tuning pins using a tuning lever. Tuning is typically the last step done after any repair or regulation work is completed. Except in extreme cases, playing your piano does not cause it to go out of tune. Pianos fall out of tune because humidity changes. Your piano is constructed of wood; wood swells and contracts with the slightest humidity changes, and that alters the tuning of your piano.